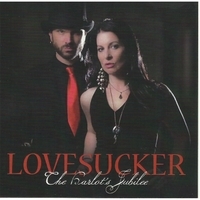 Following up their critically-acclaimed debut EP, Lovesucker releases The Harlot's Jubilee. A 5 song EP recorded by legendary Indie Rock producer Jamie Hoover. This EP was recorded in 1 take, live, without ANY overdubs, auto-tune, or any studio trickery! LOVESUCKER teams up with legendary indie rock producer Jamie Hoover to create the Southern Gothic blues rock with a dash of funk sound for ‘THE HARLOT’S JUBILEE".This new 5-song EP delivers an authentic musical experience, generated by recording it live at Charlotte’s Old House Studios in one single-take and without any studio correcting or trickery. The duo carefully crafted the 5 tracks of ‘The Harlot’s Jubilee’ to explore the sometimes grueling but always gorgeous path on that most Spiritual journey from Sinner to Saint and the Heaven and Hell in between. The EP kicks off with the soulful cover of Mississippi Fred McDowell’s ‘You Gotta Move,’ and then kicks it up with 'We Don’t Lay Down,' unveiling the war you hand over to the gods when you're fighting a losing battle in love. The mysteriousness of ‘Fallen’ is next with its razor sharp lyrics, followed by the hard-driven track ‘Wish You Could,' offering an alleged account of doing the right thing when you damn sure don’t want to. The record finishes with 'If You Want Love,' an anthem for the Lover, the Fighter, and the Escape Artist in us all.